A few months back, my good Japanese friend and her family brought me again to another great restaurant for lunch. The almost unwelcoming facade of Seryna makes you wonder if that shop is ever open at all. Sans the signs, the wood panels make the place look dark and you can only wonder which panel slides open to enter the restaurant. Apparently, Seryna is like this because like any great treasure, it takes a bit of curiosity and wanderlust for you to enter the door. What lies behind their strange door is a lunch packed with treasures from the sea. And here I am, back again in front of Seryna’s, hoping to taste the sea, with only two tiers. I’ve never seen chirashizushi like this. Usually, I get a bowl of rice with sushi morsels on top. But on this end, I’m served a tiered bento, with the top tier just for the sushi and the bottom tier for the rice and other side dishes. The sushi tier is packed with slivers of tuna, hamachi, octopus, squid, uni, shrimp, and my favorite inari. Naturally, the fish was fresh. So fresh that at some points, I don’t dip it in the shouyu anymore and just eat it straight with the wasabi. The fish was sweet and still had some salt from the sea. 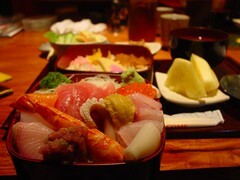 During the first time I visited, it even has some cuts of fishes that I wasn’t so sure of but I ended up eating anyway. It’s not like it’s poisoned or anything. But I guess the fact that I’m still alive after my second chirashizushi means eating random fish meat from this place is definitely worth the treat. The sushi tier in is on a bed of grated daikon which you can probably eat if you felt like eating daikon. I really thought at first they were sotanghon, but my friend corrected me and told me it was daikon. I guess daikon truly is a versatile vegetable. The bottom tier is just as exciting as the top. The rice is topped with kampyo, sakuradenbu, some daikon pickles, and tamagoyaki. But even without these, the rice alone is amazing. Seryna’s sushi rice has a slightly brown mixture, probably due to the vinegar. The vinegar is not too tart which makes the rice strangely taste sweeter. Or maybe it was brown because the vinegar had sugar in it. Either way, despite its unusual shade, the rice completely complemented the freshness and sweetness of the fish. 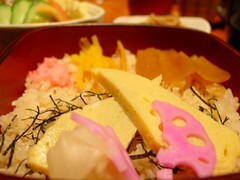 In this chirashizushi, you’d want to eat the rice. Somehow, it doesn’t feel complete if you missed the rice in this chirashizushi. It also has a side dish of potato salad and soup. For the price of Php320, extravagant sushi like that is probably one of the best sushi bargains you can find. One thing interesting about the chirashizushi in Seryna is that around 25 or 30 sets are only sold in a day. So yes, despite the reasonable price, it is still a rare treat. You have to go to Seryna’s by lunch time and make sure you beat the crowd in ordering this prized box. Cream, spice and everything nice. Whoaaa. This looks super good. 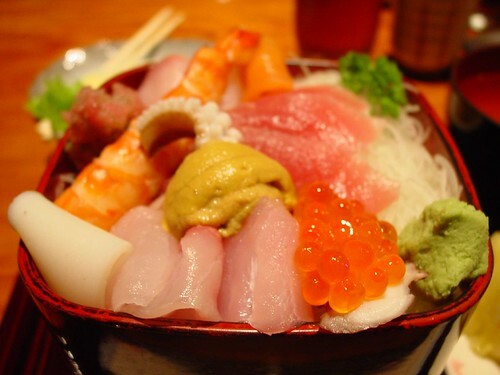 I live near Little Tokyo and I will finally check out the place and try finding this.